My son has been interested in thunderstorms, so we’ve read a lot of related books. 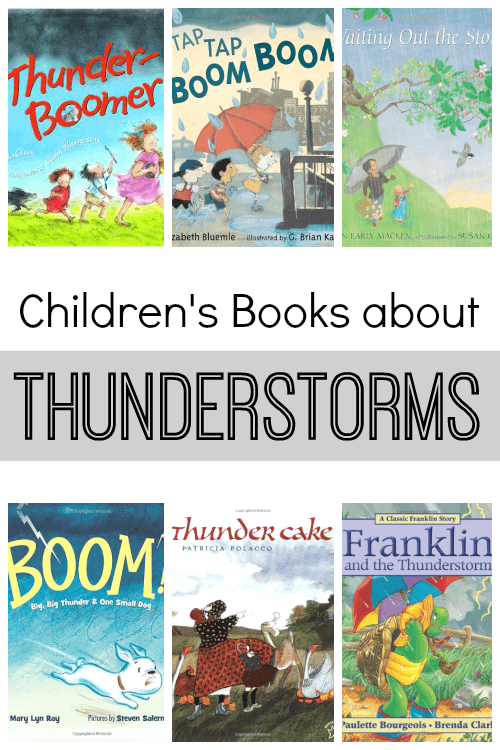 Here is a list of our favorite children’s books about thunderstorms. Lately, we have been exploring weather. This clouds and rain activity with cotton balls and droppers was a huge hit! Then my son became very interested in thunderstorms. He was intrigued by thunder and lightning. So when we went to the library, we ended up checking out several fiction books about thunderstorms. 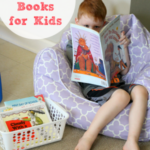 We really enjoyed all of these books and we think you will too! 1. 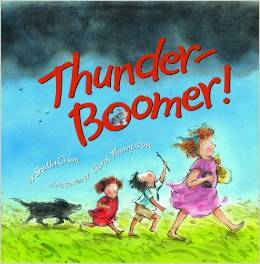 Thunder-Boomer by Shutta Crum – It’s a hot day on the farm, but soon they notice a thunderstorm heading their way. They rush to get to the house, take the laundry off the line and gather the animals, but they forget one thing! This book is very descriptive. You can almost feel yourself on the farm and in the thunderstorm. The illustrations are very appealing too. This was Evan’s favorite book. 2. 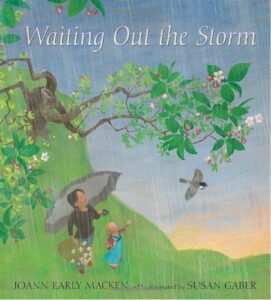 Waiting Out the Storm by Joann Early Macken – The text of this book is beautifully written with lyrical text in a question and answer format. 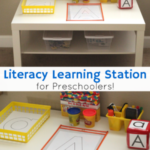 It is very easy to read and my kids were completely enthralled. The pictures are gorgeous! My son couldn’t get enough of the page with the lightning strikes. He also loved that it talked about what different animals do during a thunderstorm. This was my favorite book and a close second for Evan. 3. 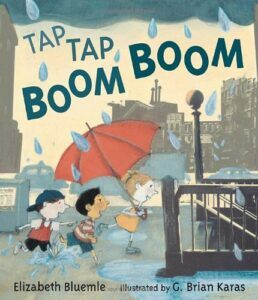 Tap Tap Boom Boom by Elizabeth Bluemle – Evan loved the rhythmic text and adored the illustrations. 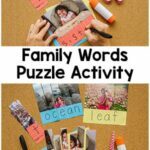 There is so much to look at and explore on each page. The setting of the story is New York City, so it was very interesting to him to see different aspects of the city. 4. BOOM! 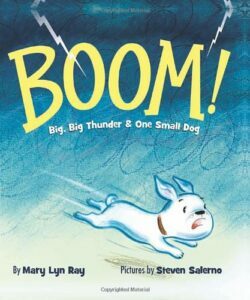 by Mary Lyn Ray – This book follows a very brave dog named Rosie who is only afraid of one thing – thunder! She tries all kinds of tactics to deal with her fear, but none of them work until she and her owner realize it is a little less scary when you have a friend to cuddle with. 5. 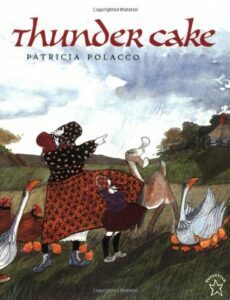 Thunder Cake by Patricia Polacco – This book lends itself perfectly to baking a cake as an extension activity. It was a little too long for my son (4 years old). However, he did sit and listen to the whole story because the text was intriguing and pulled him in. He wanted to get to the end to see what happens. 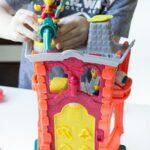 I am sure older kids would love it even more – especially if you bake a cake afterwards! 6. 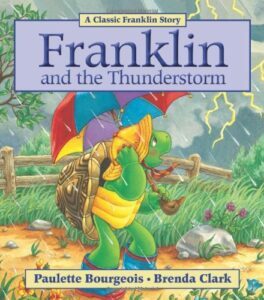 Franklin and the Thunderstorm by Paulette Bourgeois – If you have a Franklin fan in your home or classroom, you will want to check out this book. My son really likes Franklin, so this was a big hit with him. In this book, Franklin is scared of thunderstorms and must face his fear. He eventually realizes that it’s not so bad – especially when you have friends to keep you company. 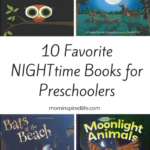 I recommend all of these books for preschoolers and young kids. They would be a great addition to a weather unit. 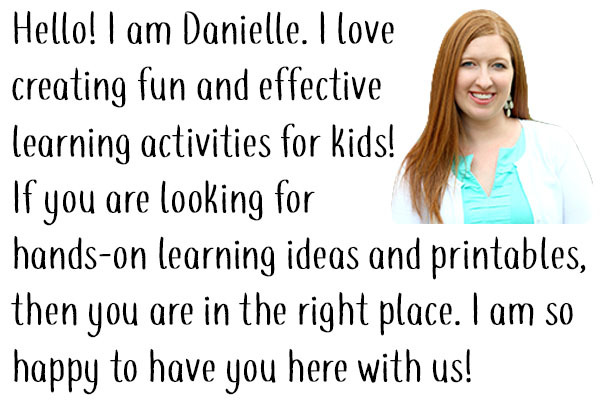 They are also a great way to help calm fears of thunderstorms with young children. 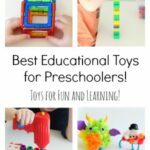 I hope you enjoy them as much as we did! After reading all of these books, we decided to make thunderstorms with play dough and pipe cleaners. It was great fun!